Summer time, the time to create simple, low-maintenance garden planters to brighten up your outdoor living space. This container was knocked together using the slats from an outgrown child’s bed. The untreated softwood will rot, but it’ll darken beautifully and encourage to moss to spread all over (hopefully). Not all containers need to be full of flowers, a simple pebble and a piece of bog wood set this ornamental grass off in a pleasingly Zen kinda way. Shops selling aquariums will almost always stock bog wood, I bought the grass for 50p from a car boot sale – so I don’t yet know what variety it is. Keep a spray bottle near the container and spray the surface to encourage the moss to grow – moss only grows when it has light, moisture and nutrients, if any of these is missing it simply waits (that is why it is so hard to eradicate moss when it’s not wanted). A friend gave me her veg box when she went on holiday, it reminded me of my youth working in a fruit and veg shop so I decided to use the box. Again, untreated softwoods will rot quickly and with slats as thin as a vegetable box I’ll see how it’s doing in spring. Plants were bought from a car boot sale for very little money, except the ivy which was £1 from the supermarket. It’s a great conversation starter! Reuse, Recycle, Reduce – Upcycled Planters! The only stipulation on what cannot be an ornamental planter is size: the container must hold enough moisture to let the plants survive really hot weather until you can next water them. This large kettle holds four liters comfortably – knock holes into the bottom and stand it on something to allow proper drainage. Here you can see the white flowers of the Topia complemented by a skirt of Babies Tears, in most places considered a weed but sometimes seen in a bottle garden, can be used as an indoor plant. 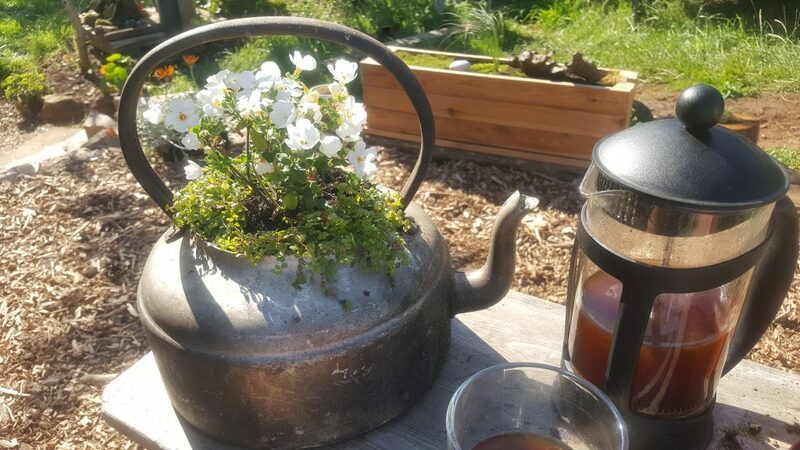 This old watering can was rusted through in several spots, so I had no qualms about re-purposing it! The Cordiline provides an architectural quality, the Ivy will hang down nicely. In the bottom of the watering can I have placed an open ice cream tub containing a brick, this will act as a sump for water and make this container a low maintenance garden feature – both these plants need very little care. Watering is done by unscrewing the shower rose and filling the sprout with water. I love broken terracotta pots, this one is making a Fig very happy. Figs get a bit too big if grown in the ground, they are more suited to cliff edges. The pot is large but contains several bits of old rock and paving slabs, meaning the fig has to work a bit harder – something it loves to do. This bucket was in perfect condition before I started and I must admit I wasn’t too keen to puncture drainage holes in the bottom! After a couple of weeks staring at it I took the plunge. Two dramatically different leaves, both evergreen, set this off nicely and as an added bonus the whole ting can be picked up and moved with the handle – perfect if you think you might be in a different home anytime soon. Avoid vintage shops, think more; second hand shops, garage sales and the local tip. Also loving the succulents, these disguarded telegraph poles make ideal planters – we left them in the corner of the garden until the middles were rotted enough for us to drill right through the short lengths. The succulents should be happy here as it will drain freely, but never quite dry out. Succulents sometime throw ‘pups’, literally complete tiny babies of themselves – pull one off gently and put it in a pot ready for your next planter idea. Previous post: We now take Bitcoin, Litecoin and other Alt Coins!